It seems the UKIP reckons this ethnicide of the English is being carried out by the Tories, Lib Dems and Labour on behalf of what it calls the ‘satanic’ EU. 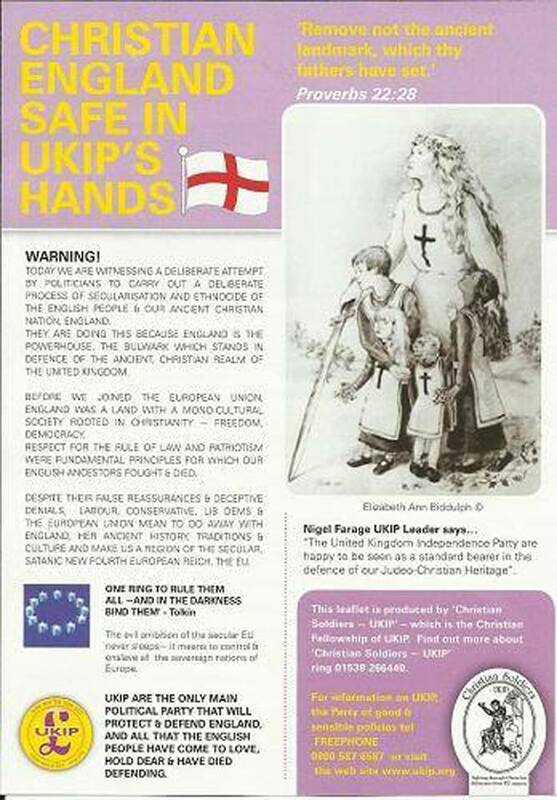 The tinfoil-hat comments- worthy of the pottiest opinions from members of the US Tea Party – can be seen in this UKIP leaflet being distributed at the UKIP conference. Please please please don’t tell me these people actually have a real chance of winning any meaningful power in our normally (relatively) sane country. Sorry but just having lived through the Referendum I can believe anything of anyone. Tell them lies on the telly and in the papers, they will believe. There will be no pound, BBC, oil, pensions,banks. If is said often enough by nice men in nice suits they will believe, I despair. Watching the BBC news just now, you’re forgiven for thinking The UKIP are the Royal family & the presidential candidate for Little Britain, rolled into one…. And Douglas Carswell left the toxic Tories for this? It’s just another manifestation of ukips connections to the League of Empire Loyalists. It seems this site is read by a whole bunch of Ostriches who will still vote for the same old LibLabCon Merchants. It is a good guide as to how inflexible, unimaginative and stupid the British Electorate really are. The European Union has an open borders policy. This is one way to break down the nation states on the road to the European super-state. The trouble is that only the far right is speaking against it. It is not politically correct for the left to even think about it. That stops the debate. What began as a trading agreement between different nations has morphed by stealth into the European Government. (It does not matter what it is called, it rules administratively.) Some of us disagree with such an undemocratic process and we are not racists or on the far right. the eu is controlled by satan. For ages I’ve said that UKIP won’t be an answer for anything except more hurt. Yet the alternative is going to be more of the same s##t only delivered by a different color tie. I’d better keep going learning Chinese and Russian for when they come and save us from the tyranny of democracy. Couldn’t have said it better myself. It’s quite incredible how so many people still believe that our country is fit and thriving, and that we need habitual liars like Clegg, Cameron and Milliband to steer its course. This is a war for people’s minds. UKIP may not be the total answer, but something is needed to break up the LibLabCon strangehold….and they are the only tool on the horizon right now. Once the wedge has been driven in, then major changes can follow. Only by exiting the EU might we get something done regarding human rights in this country, because while we are a member they are doing nothing to control IDS/Cameron and their policies against the vulnerable. The LEL was a right wing pressure group. it was not a political party. “An organisation” is how I described it. And the difference you are wishing to point out is? UKIP are not the only tool to challenge the LibLabCon stranglehold. The Main parties are quite happy to tout them as such, because UKIP are no threat to them. Having a party of the FAR right prominent in the media allows the Tories and other parties to present themselves as moderate and centrist, a positioning which appeals to British voters.In fact all three main parties have all drifted so far to the right they make Margaret Thatcher look like a wet and Disraeli like a socialist agitator. Left-wing alternatives – the Greens, Respect, Plaid Cymri etc exist, although you would never find this out from the mainstream press. nor from the election papers, because most of the parties are so marginalised and poor they cannot afford to field candidates in most seats.